Whether it’s a frisky pup in need of a “Quickie” bath or a knotted mutt that needs to go from “Furball” to fabulous, Pet Head has the perfect product to suit every dogs needs. The line of shampoos, crème rinses and sprays are made with ingredients specially formulated to pamper and indulge all doggies making them clean, fluffy, silky and smell oh’ so good! 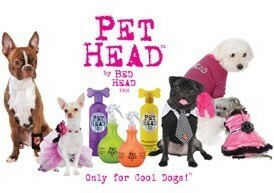 All Pet Head ™ formulas are pH adjusted and free of parabens, petroleum derivatives, propylene glycol, sulfate and DEA.